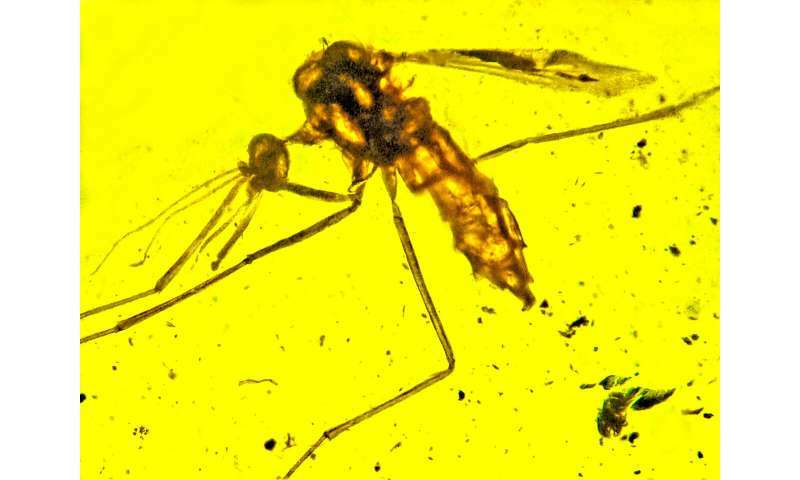 Priscoculex burmanicus, a newly identified genus and species of anopheline mosquito, preserved in amber. Credit: George Poinar Jr.
"This discovery provides evidence that anophelines were radiating—diversifying from ancestral species—on the ancient megacontinent of Gondwana because it is now thought that Myanmar amber fossils originated on Gondwana," said Poinar, an international expert in using plant and animal life forms preserved in amber to learn more about the biology and ecology of the distant past. A battle of the vampires, 20 million years ago?